Billionaire GOP Donor Finally Opens Checkbook For 2014 : It's All Politics Sheldon Adelson, the Las Vegas casino magnate, is giving $20 million to GOP-oriented "social welfare" groups for use in midterm campaigns. 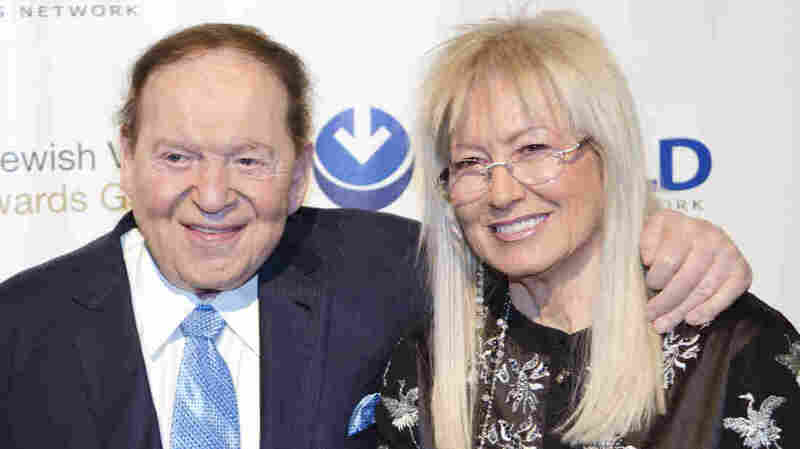 Sheldon Adelson and his wife, Miriam, gave $92.8 million to conservative superPACs and related groups in the 2012 election, according to the Center for Responsive Politics. Republican Party leaders are urging big donors to start writing checks, and the check-writers now include Las Vegas billionaire Sheldon Adelson. NPR has confirmed a Politico report that Adelson is putting in $20 million, evenly divided between Crossroads GPS and American Action Network. Both are 501(c)(4) social welfare organizations that don't disclose their donors — or nondonors, as an AAN spokesman put it. Pro-Democratic superPACs have surprised conservatives by outadvertising them in key races. The Crossroads GPS funds are aimed at Senate races, where Republicans need a gain of six seats to win control of the chamber. The Wesleyan Media Project reported this week that on broadcast television between Aug. 29 and Sept. 11, there were more than 34,000 pro-Democratic ads in Senate races, versus fewer than 30,000 pro-Republican spots. Adelson money for American Action Network is targeting House contests, even though the House GOP majority is considered secure. Last week AAN said it is spending $5.3 million on ad campaigns against six Democratic incumbents. The Wesleyan Media Project report found that Democratic candidates in those races were benefiting from a 2-to-1 edge in advertising. Adelson is CEO of Las Vegas Sands Corp., which has casinos in Las Vegas, Pennsylvania, Singapore and Macau. His wife, Miriam, is a physician. These two contributions mark his first high-dollar, high-profile spending this cycle. In 2012, the Adelsons gave $92.8 million to conservative superPACs and other organizations, far outpacing other donors of disclosed contributions, according to the Center for Responsive Politics. Federal Election Commission data show that the top two Adelson beneficiaries in 2012 were Winning Our Future, a superPAC promoting Newt Gingrich's presidential bid, with $25.5 million; and American Crossroads, the superPAC affiliate of Crossroads GPS, with $23 million. Spokesmen for Crossroads GPS and American Action Network would neither confirm nor deny Adelson's contributions.